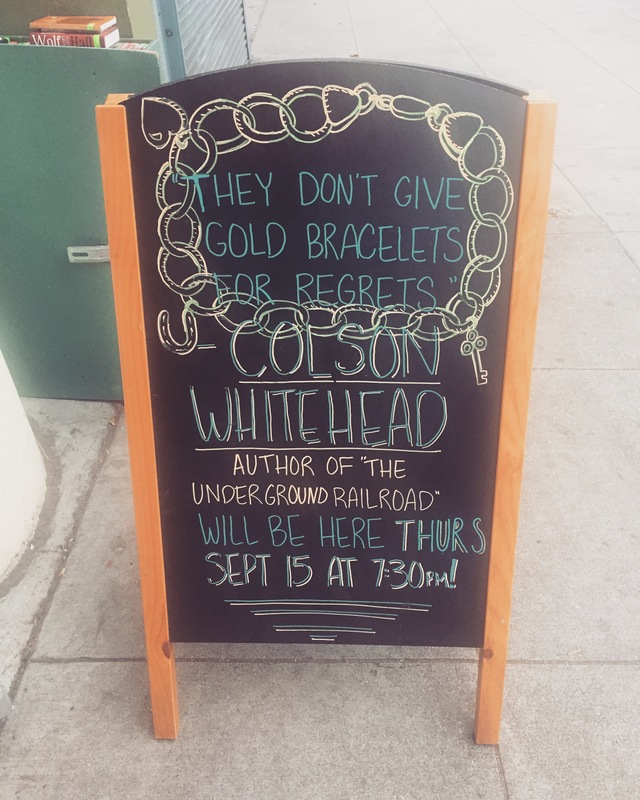 I’m usually a tad bit late to everything but for Colson Whitehead’s reading at the Green Apple Books in the Sunset, I was an hour early. His book The Underground Railroad has just been longlisted for the 2016 National Book Award for fiction and while the reading wasn’t for another hour, the place was already packed. While waiting for the event to start, I resumed reading as I was only halfway through the book. And while I have read the work of many black writers and poets (Baldwin and Lorde and Finney are favorites), I haven’t read a lot of books on slave narratives. A few weeks ago, I wrote a piece about Yaa Gyasi’s Homegoing at the time of Alton Sterling and Philando Castile’s deaths at the hands of the police, shaken with anger at a system that does not remember. The Underground Railroad is the story of Cora, a slave who ran away from a plantation in Georgia through a real-life railroad built underground. She used the railroad three times: one heading towards the Carolinas, the second towards Tennessee and then Indiana. Historically, the “underground railroad” was a network of secret routes and safe houses, established by abolitionists and free slaves to aid black folks to get to free states. In South Carolina, Cora got her first taste of life outside the plantation as “Bessie.” She lived in a dormitory with other free women, overseen by white nuns who facilitated their job placement, made sure they were getting some education, took care of their health. It was here that Cora was reminded of her mother Mabel, who ran away from the plantation herself. She was never caught, but she never came back for her daughter either. It had been a whim. Once Mabel ran, Cora thought of her as little as possible. After landing in South Carolina, she realized that she had banished her mother not from sadness but from rage. She hated her. Having tasted freedom’s bounty, it was incomprehensible to Cora that Mabel had abandoned her to that hell. A child. Her company would have made the escape more difficult, but Cora hadn’t been a baby. If she could pick cotton, she could run. She would have died in that place, after untold brutalities, if Caesar had not come along. Along with her pursuit of freedom from slavery, Cora struggled with a child’s yearning for her mother and the pain of abandonment. There were times when this gave her hope, that she knew if her mother could do it so could she. At other times it filled her with the unspeakable anger of being left to suffer, of terrible loss. Cora never finds out what happened to her mother (whether she made it to Canada at all), but this is where Colson’s genius becomes apparent. Towards the end of the book, there is a chapter on Mabel. After having to flee South Carolina for fear of being caught by Ridgeway, the slave-catcher, she lands in North Carolina where she hid in the railroad conductor’s attic for months. She couldn’t come out, as the white conductor and his wife did their best to conceal harboring a runaway slave. From the attic, she watched bounty hunters and informers rewarded with every black life caught at the park across the house. It took only one event for the couple’s cover to be blown and soon enough, they themselves were hung on a tree to burn. Ridgeway, who was once hired to look for Mabel, found redemption as soon as he caught Cora. Back at the reading, Colson read a few passages from the book. Someone asked if he was intentionally trying to make his readers like Ridgeway, in spite of his character. He called him an imperialist. This stuck with me as I continued to read the book, confounded at times with how a slave-catcher can embody such a vast and imposing concept. And then it hit me, as I remembered a few lines when Colson was just introducing him. Ridgeway commanded his appetites in those days, withdrawing before his confederates’ more egregious displays. The other patrollers were men and boys of bad character; the work attracted a type. In another country they would have been criminals, but this was America. This was America. A slave-catcher’s admission to the state of the country back then reverberates to this day, not just within the country but beyond its guilt-ridden borders. As I write this, more and more black lives are being taken at the hands of the police. In Charlotte, in San Diego. The black body is seen as a threat, an imminent danger, when in the past century alone it is the same exact body that built this nation. The girl next to me at Green Apple Books said she loved the book, that she cried at the most unexpected moments. She talked about Colson’s jerky prose, how it made her uncomfortable at times. I wondered: was that the only thing that made her uneasy? At a time when the #BlackLivesMatter movement is met with #AllLivesMatter and/or #BlueLivesMatter, did she make connections with the prose and her whiteness? The mouth of the tunnel started as a tiny hole in the dark. Her strides made it a circle, and then the mouth of a cave, hidden by brushes and vines. She pushed aside the brambles and entered the air. allow guest posting on your blog ? I can write high quality posts for you.